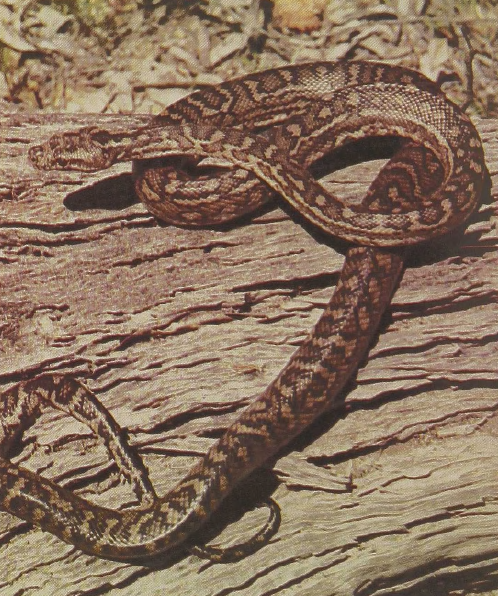 Several races of these beautiful pythons, which grow to 6 to 8 feet in length, range over most of Australia. In photographs, their beautiful red and yellow blotched pattern, variegated with black, seems to stand out sharply, but actually it blends into the background when the animal is resting among shrubbery. Carpet Pythons are important factors in the control of birds and small mammals, such as rabbits, which they hunt mostly at night, searching both in underground warrens and in trees. Like most other pythons, they are egg-layers.